Art work by Joe Boruchow, which criticizes the Union League of Philadelphia by flying a Confederate Flag atop the building, adorns a bus stop at the intersection of Broad St. and Spruce St. on Sunday, February 10, 2019. A Confederate flag flew atop the historic building that houses the Union League of Philadelphia in a provocative piece of street art that was erected over the weekend on a bus shelter on South Broad Street. Joe Boruchow’s vision for the artwork formed more than two years ago as he marched through the streets of Philadelphia, protesting the Trump administration. When he passed the Union League, he said, he noticed club members and their guests on a balcony. Frank Giordano, a League member and past president, was not amused. He was out of town when he learned of the art display from the Inquirer and Daily News. Giordano, president and chief executive officer of the Philly Pops, said the League is private, "but all-inclusive, with members of both parties. ... League members are patriotic and support the free-enterprise system.” He said members pay several thousand dollars a year to belong. Calls placed to Charles Davidson, the current president, and emails sent to Union League administrators and officials on Sunday afternoon were not returned. Boruchow, 43, said he knows the league was founded to support the Union, not the Confederacy. His decision to depict the Confederate flag on the roof of the building is meant to poke wealthy, powerful Republicans, who he believes dominate the league’s membership ranks and perpetuate inequality. The flag is sure to drive public conversation about this particular piece of art, but Boruchow said he hopes members of the public will notice other elements of the drawing, too, such as the police officers chasing a group of hooded teenagers running though the subway. It took Boruchow 60 hours of careful work with an X-Acto knife to cut his drawing from a single sheet of black paper. Joe Boruchow said his vision for his Union League piece of street art formed more than two years ago as he marched through the streets of Philadelphia, protesting the Trump administration. 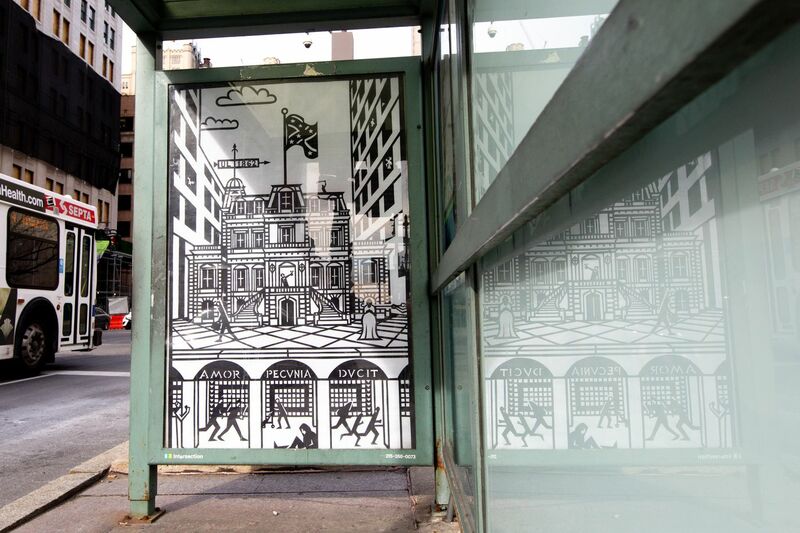 Boruchow is unsure how long his art work will be on display in the bus stop at Broad and Spruce Streets before it’s inevitably taken down but said that displaying his work in public, even for a short time, is the best way to reach the masses and spark conversation. It was still there Sunday afternoon, at the time the League held its annual Lincoln’s Birthday events and a public open house.